A relative newcomer in the hosting business, Web Hosting Hub was founded in 2010. The company had one big goal: to provide easy-to-setup and affordable web hosting plans, supported with domain names, free web applications, custom hosting solutions and web design services for your business. This means that, for now, they offer only shared hosting in two data centers. So far, they are doing excellent job. But do they really deliver on their promises? You be the judge. One very surprising thing about Web Hosting Hub is that you will be able to buy only shared hosting. At first we thought we overlooked other types of hosting like dedicated or VPS on their website. But after some thorough search, we can assure you that shared hosting is the only hosting available. Shared hosting is offered in three different plans. If you want backup service, it will cost an extra $1 per month. Spark: unlimited disk space and bandwidth, storage for unlimited emails, three free web transfers, two free website domains, 10 MySQL databases, five parked domains, 25 subdomains and $75 in free advertising credits. Nitro: unlimited disk space and bandwidth, storage for unlimited emails, three free web transfers, unlimited website domains, unlimited MySQL databases, unlimited parked domains, unlimited subdomains and $175 in free advertising credits. 20-percent discount for web design services. Dynamo: unlimited disk space and bandwidth, storage for unlimited emails, three free web transfers, unlimited website domains, unlimited MySQL databases, unlimited parked domains, unlimited subdomains and $250 in free advertising credits. 30-percent discount for web design services. The process of setting up your account and website left us with mixed feelings. Although you have to pay up front for the whole year, you do have a 90-day, money-back guarantee. That’s one of the longest money-back guarantee periods available and very few of providers in the industry offer it. While setting up the account, you can choose to immediately install WordPress or PrestaShop, which is a nice touch. It’s like coming to already furnished apartment that’s set up the way you like it. However, you’ll then need to be verified, which you will do via telephone. Not a big deal, unless you aren’t from U.S. and your only telephone number is mobile. Apparently, they never heard of roaming. We still got a verification via email, which left us puzzled about why the telephone verification was necessary in the first place. Your Account Management Panel has four main parts: My Account, Billing, Domains, Add Services and Specials. While the first three are self explanatory, Add Services allows you to add more hosting plans or get site design from their staff. Specials are mostly advertisement and marketing credits. In the upper right corner is the Help link, so all your basic needs are in one place. Oddly, you will be assigned a random username for your cPanel. While you obviously choose your password, this seemed like annoyance, because you will be assigned a name completely unrelated to you. 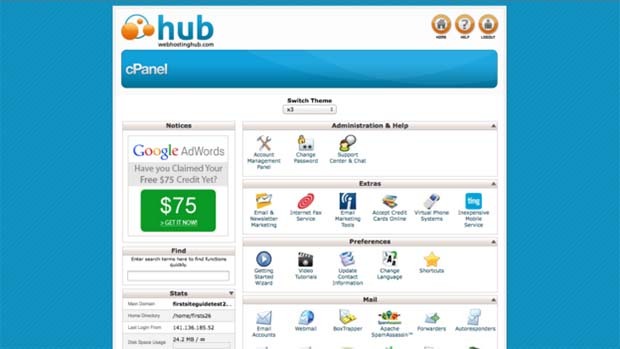 But once you log in, you’ll be greeted with the standard, widely used cPanel layout. While there are all kinds of useful things, the real gem is a script library that’s filled with all kinds of goodies for every aspect of your website—from polls and surveys to ad management, e-commerce, RSS, frameworks, file management and more. The selection is filled with so many options that, like a kid in a candy store, you can blow a lot of time just browsing. Email is given greater attention in the cPanel than with other hosting providers. A nice touch is the McAfee email protection, but there is an extra charge for it. There are also Google apps wizard, account level filtering, MX entry and more. You’ll have the standard choices of webmail software, so nothing is missing. And there are no limitations on the number of email accounts you can have. You’ll get to create your first account during the wizard setup. Since you are welcomed with the standard cPanel, setup is also pretty standard. You’ll be greeted with a welcoming wizard that will take you through the basics. If you chose to install CMS beforehand, you are almost set up, but if you didn’t, you will have easy one-click installation. If you transfer your old sites, there’s no fee for the transfers, and if you want to upgrade them with some scripts, there are many to choose from. As we mentioned, you can install WordPress or PrestaShop while creating your hosting account. A nice touch that eliminates few extra clicks and saves a bit of your time. However, in their script library, which relies on Softaculos, you’ll see other open-source tools for blogging and microblogging, and content management systems, as well. Installing them is relatively easy, all you need to know is which in directory you want them to be placed. Drupal, Joomla, Magento and OpenCard are just a few of the CMSs, and although majority of users will go with WordPress, there are other tools like Serendipity and Dotclear. You just need to choose the one that suits you best. Web Hosting Hub doesn’t offer or showcase any guarantee about uptime. This should set off alarm bells. However, during our uptime test with Uptimerobot, there was 0 percent downtime. And we were testing the least-expensive plan. We imagine that more expensive plans get the same, or even better service, if that’s possible. As usual, we did the loading test with Loadimpact. The server was located in Los Angeles, so for the majority of tests we focused on Ashburn, Virginia on the East Coast. The response time was just below the 0.8 seconds, which is slightly better coast-to-coast performance than the average hosting provider. Portland came in at slightly above 0.5 seconds and Palo Alto at around 0.3 seconds. However, what was really wonderful was the same response time no matter the number of users. The line was almost straight, like a calm sea before the storm. And the storm occurred around 15 percent of the time. and when it was bad, it was abysmally bad. Although we were delighted with the U.S. loading tests, sometimes they looked more like a stormy sea. This occurred even more when it came to intercontinental tests. Sao Paulo had some problems with higher numbers of users and a maximal response time of 8 seconds. Singapore was slightly better with 4 seconds at its worse. But the most baffling response was from Sydney, which had problems with just a small number of users. When it works, it works great, but when it doesn’t work, it really doesn’t. Luckily, it works a tremendous amount of the time. When you click on the Help Center, you’ll probably expect to see chat or ticketing services. Not so. This page is dominated by FAQs and tutorials. This isn’t a bad thing. But when you have a serious problem, you may panic because you can’t find the chat or ticketing system. Relax, they are there, way down at the bottom of the page in a smaller font. However, in the account management panel, just below Help Center, again in a smaller font, is “Get Help.” There you’ll be provided with a few basic guides, chat, and the ticketing system. Response time was a matter of minutes for the ticket and just seconds for chat. The staff was polite and efficient. If you have chat help, you’ll get a transcript of the exchange. That way, if you have the same problem in the future, you can skim through the transcript for your solution. The only thing that wasn’t fast with Web Hosting Hub support was their means of feedback. Instead of the usual questionnaire, you will be asked to send an email to their feedback manager. Web Hosting Hub offers discounted rates for one year. At the end of the year, prices will increase by $2. An alternative is to buy hosting for 2 or 3 years and subsequently they will cost you one or two dollars less per month. There is no monthly payment plan for these two- and three-year contracts, but the long-term discounts make it an attractive option for some people. Web Hosting Hub isn’t one of the more prominent hosting companies. We wondered why. However, after using the services, we get it. Although it has a lot to offer, certain features are hard to find on their website. But the company still has a lot to offer. It may take a little time to get used to some features, but you’ll get the hang of it pretty quickly. When you communicate with their very friendly and helpful staff, you’ll be checked for verification of your account—a nice step to protect your online security. In the end, we can conclude that Web Hosting Hub can be slightly awkward and frustrating at times. But, if you’re looking for a great shared-hosting price, combined with good service, this is your place. If you need more, take a look elsewhere.